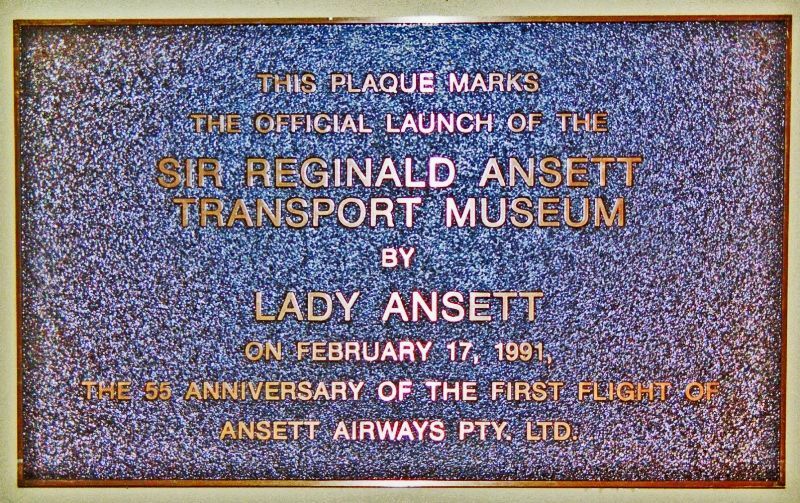 A plaque commemorates the official opening of the Sir Reginald Ansett Transport Museum in February 1991. The museum was opened on the 55th anniversary of the first flight of Ansett Airways. The museum is dedicated to transport and tourism Pioneer Sir Reginald Ansett and housed in the company’s first aircraft hanger. On the morning of 5th December, 1931, a young Reginald Ansett drove a Studebaker car from Hamilton to Ballarat. The Ansett empire was born. Just eleven years later, this one-man passenger service, that has started with a secondhand car, had become the biggest road passenger service in the Commonwealth. The “road” was not always a smooth one. Around the mid 1930s the Victorian Government took steps to curb the development of the young Ansett company . . . it was proving a more popular service than the State-owned railways. Undaunted, Reginald Ansett flew his moth aircraft to Sydney, navigating with a road map, and bought a Fokker Universal passenger plane. On 17th February, 1936, the Fokker Universal left Hamilton for Melbourne and the rest is history. Ansett was then an international airline operating one of the most modern fleets in the world. 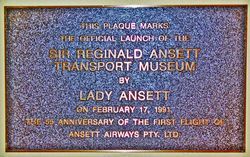 This Plaque Marks The Official Launch Of The SIR REGINALD ANSETT TRANSPORT MUSEUM By LADY ANSETT On February 17, 1991. The 55 Anniversary Of The First Flight Of Ansett Airways Pty. Ltd.